Collagen stimulation therapy or CST for short goes by many names – microneedling, dermal needling, medical needling or dermaroller. Dr Des Fernandes the founder of Environ, is the pioneer of needling and developed this treatment in 1997 as an alternative to aggressive lasers and peels, as these treatments compromise the skin. He therefore wanted a clinically proven treatment that could naturally induce your own collagen and elastin to restore a youthful skin and generate all over skin health. It is especially effective for addressing the visible signs of ageing as well as sun damage, scarring, slackened skin, stretch marks, uneven skin tone and dilated blood vessels. Collagen Stimulation Therapy™ can be done on all areas of the face and body and is suitable for all skin types. 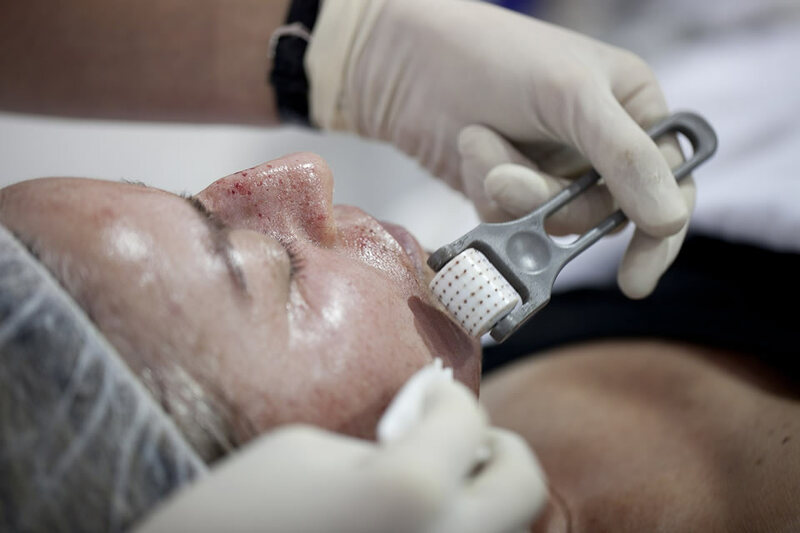 Dr Des has spent many a year perfecting the treatment and this is the procedure I follow to guarantee the best microneedling treatment with the best results. The whole process takes about 90 minutes, first of all we numb the skin (patch test is required) and then we glide a roller over the skin which has microscopic needles (1-1.5mm), these tiny needles penetrate into the dermis and cause a micro trauma on the skin. This micro trauma causes tiny pin pricks of blood on the skin and once this has happened we know the collagen and elastin has been kick started. This micro trauma tricks the skin into natural healing mode and floods the area with collagen and elastin, not any type of collagen and elastin this is type 1 collagen, the sacred words if you want a more youthful skin. After we’ve rolled, we clean the skin and put an alginate mask on to calm the redness, remove the mask and apply nourishing peptides and Vitamin A, C and E.
What are the side effects and the healing process? After the treatment your skin will be a little pink and you will need to not handle it for the rest of that day. you can apply makeup the next day and your skin may become dry but by day 4 the skin is looking normal and by day 7 starting to glow. The real wow results take about 3-4 months to come through but it sure is worth the wait as your skin will look plump, smooth and healthy. Not only that, but the results can last years. Results will be visible from just one treatment but for best results, we would recommend a course of 3 or 6 with 7 days between each treatment. This allows the skin to heel between sessions and prolongs the collagen stimulation from one treatment to the next. To get the best from the treatment you need to be applying Vitamin A to your skin for 3 months before treatment. This should also continue after treatment. You will be given a peptide serum which you apply morning and evening after the treatment until it is all used and continue with your regular homecare routine. If you are home rollering we would advise you avoid this until the redness has subsided. SPF should be applied daily and you should not expose your face to strong sunlight for the first 48 hours, a full aftercare procedure will be given at the time of treatment.